Does OS X El Capitan Have Auto Save and Versions? It can be hard to discern at a glance whether an app in OS X El Capitan uses the Auto Save and Versions features introduced with OS X Lion. In Mavericks, the Save a Version command went back to its original (and less-confusing) moniker, which is plain ol’ Save. Fortunately, there are other ways to determine whether a program supports Auto Save and Versions. The next is whether the app has Rename and Move To commands in its File menu. If it doesn’t, it’s old-school; if it does, it’s Auto Save- and Versions-savvy. The easiest way to tell, however, is to look at the title bar of a document. 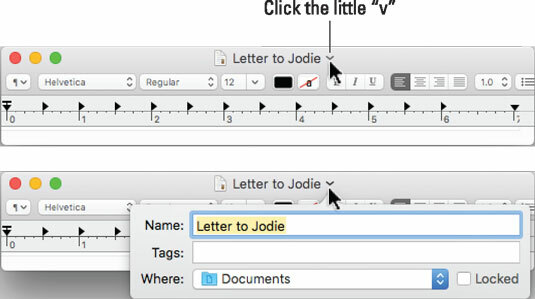 If it displays a little V to the right of the document’s name when you hover your cursor over it (as shown on top of the figure here) and a pop-up window appears if you click the triangle (as shown on the bottom of the following figure), it means that the app supports Auto Save and Versions. One last thing: Everything mentioned applies to every app that saves files, with or without Auto Save and Versions. However saving a file with Auto Save and Versions has one additional effect: It creates a new version of the file that you can access with Time Machine. To obtain that kind of functionality in apps without Auto Save and Versions, you’ll need to use Save As to create a new version of the file periodically.